Are You at a Beacon-enabled Location? Download the free Live Beacon app from the App Store or Google Play to receive information from nearby beacons. Live Beacon is a small, battery-powered, cloud-controlled device that transmits web content to smartphones and tablets up to 30 meters (100 feet) away. Transmit information about any object or place. Like a painting in an art gallery, an artefact in a museum, or the menu in a restaurant. Create self-guided tours, where the information automatically changes as visitors move from one beacon to another. Share content with an audience; whether that's a handful of colleagues in a boardroom, a class of students, or thousands at an event. Build awesome location-based experiences; such as mazes, soundscapes, treasure hunts, and more. We like to say it's: the little gizmo that transmits info! Transmit location-specific web content to visitors' smartphones & tablets. 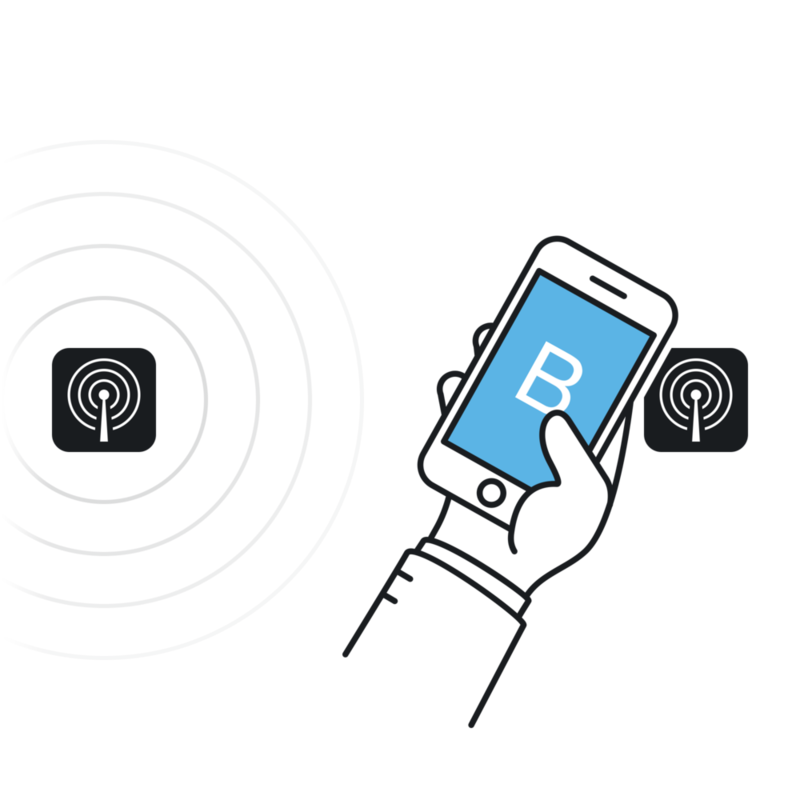 Live Beacon isn't just a device — it's a simple, yet powerful, combination of hardware and software. The beacons transmit your content. The cloud portal is used to update your content. And the free app receives your content. Transmit any web page, video or web app; or use the drag-and-drop editor to create content. Change the notification message that visitors receive (like a text message) when they arrive. Adjust the range, from a tap (like contactless) — up to 30 meters (100 feet). Connect digital content to the physical world. 1) Position beacons near to points-of-interest. 2) Update their content using the cloud portal. 3) Visitors with the Live Beacon app automatically receive a notification when they arrive. 4) As they move from beacon-to-beacon the content automatically changes. Live Beacon also supports The Physical Web to receive content without downloading the Live Beacon app. *We may have made this word up. Looking for iBeacon or The Physical Web? Live Beacon supports both Apple iBeacon and The Physical Web beacon technologies, it works with iOS and Android devices, and — unlike other beacons — you don’t need a computer science degree to set it up! You can change all of a beacon's settings via the cloud portal website, from any web browser, anywhere in the world. Live Beacon is the world's simplest beacon. Live Beacon starter packs include everything you need to get beaconing! A two-pack is just £99 (around €110 / $130). When you're ready for a larger deployment, beacons can be ordered in bulk. And if the Live Beacon app doesn't tick all your boxes, we also undertake bespoke projects built on top of our technology. If you've got any questions, or would like to learn more about Live Beacon, please get in touch — we'd be glad to help.